Hey, Mr. Mayor: Don't mess with Wendy Katten! In case you missed it, there was a televised toe-to-toe battle the other day on the future of public education in the age of Mayor Emanuel. It took place on the August 26 episode of Chicago Tonight—shout-out to host Eddie Arruza—and featured two advocates with vastly contrasting points of view. In one corner, representing the Chicago Public Schools, was Andrea Zopp, a mayoral appointee to the board of education. 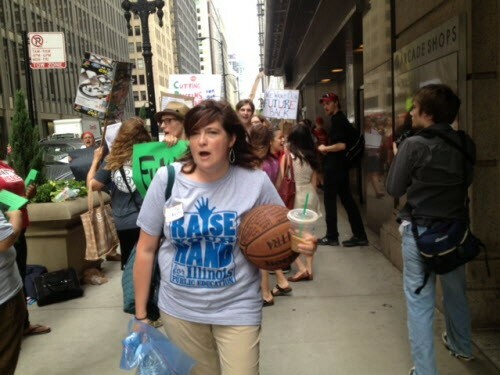 And in the other corner, representing Raise Your Hand, a citywide coalition, was Wendy Katten, a CPS parent. The specific topic was charter school funding. 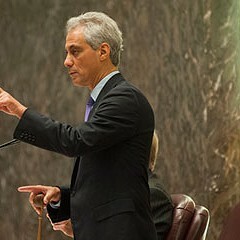 Or: Has Mayor Emanuel increased funding to charters while cutting funding for traditional public schools? Katten said yes, or "We've seen massive cuts to our traditional schools" and "We've seen increases to charter schools." And Zopp said, no, that was not the case, or "You're wrong—it's factually incorrect." Katten pressed the point, citing evidence from the board's budget, which she said she'd consumed the better parts of many days and nights reading and rereading. Talk about giving to the cause. At which point, Zopp said: "It's not accurate, Wendy, and you know that." Well, that's how our mayor might put it. So who is correct? 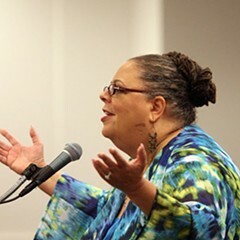 Katten, the parent, who's virtually powerless in determining how CPS apportions hundreds of millions of public dollars? Or Zopp, the mayoral appointee, who gets to vote on major budget issues affecting tens of thousands of Chicago students. For the answer, let's go into the belly of the beast—the CPS budget. Don't worry, folks, I promise to try to make this as painless as possible. First, go the Chicago Public School home page. See the "About CPS" heading on the top? Click on it. Now click on "Financial information." Is everybody with me? 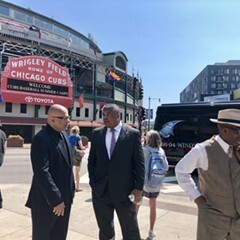 I'll take a brief break to allow the aldermen out there to catch up. Just teasing. You know I love every single one of you—even if you were asleep at the switch when Mayor Emanuel gaveled through that South Loop DePaul deal. OK, click on "FY Budget 2014." On the left, you'll see a list of items. Click on the one that says "Interactive reports." C'mon, everybody. Don't give up. We're almost there. At the top of the page, you'll see a selection of headings. Click on "Budget by Account." You'll see an itemized list of how CPS is spending your money. Resist the urge to weep, and click on contracts. At the bottom of the list is pay dirt: "Student tuition for charter schools." Welcome to transparency, Mayor Emanuel style. Yes, the mayor has a place on the Internet where you can find how he's spending your tax dollars, but he's going to make you go through hell and high water to get there. Time out for an explanation. Basically, charters get most of their funding by billing CPS for every student they have enrolled. The more students they have, the more money they get. The last two columns are the important ones. According to CPS, you, the taxpayers, spent $487.8 million on charter schools in 2013. Next year, CPS has you on the hook to spend about $568 million. That's about an $80 million—or 16 percent—increase. As you can see, the charter school take has been rising over the last few years. In fact, researchers at the Center for Tax and Budget Accountability looked through ten years of CPS budgets—talk about a grueling task—and discovered that the charter take had increased by $488.4 million, or 612 percent, in the last decade. Back to the current budget. If you want to compare how traditional schools are faring, well, that's hard to do. Because Mayor Transparency has stocked the "Find your school budget" part of the site with spending on stuff that has nothing to do with individual schools. Just in case any inquiring taxpayers might want to know how their tax dollars are being spent. For assistance, I called a computer wizard I'll call Cool Cat—'cause that's how she rolls—and she took me through the steps. And if I can do this, readers, so can you. Take it away, Cool Cat. "OK, go to 'Interactive budget' and click on 'Find your school budget.' Now click on 'Unit group.' Once you do that, click on 'Schools' and click apply. Now go to 'Unit type.' Select 'CPS public school.' Click apply. You can choose ascending or descending order—which would you prefer?" "How about descending order by budget cuts? Then we can see who really got screwed." "OK, click on the up arrow." And there you go—a sea of red as far as the eye can see. As far as I could tell, the only schools that didn't get cuts are the so-called welcoming schools (which took in students from closed ones), turn-around-schools, and a handful of lucky schools whose parents/principals must know the right people. All told, the traditional schools were cut by $255.8 million. Looks like Katten—the CPS parent who doesn't get to vote on school issues—was right. I don't know why CPS would deny there's a charter school boom going on. From the moment he returned from Washington, Mayor Emanuel's made it clear he intended to create more charters even as he's closing traditional schools. He says it's 'cause he wants to give parents more choice. But I think it's 'cause employees at the charters make less money than those at traditional schools. And as everyone's learning, the less money the mayor pays on school employees, the more money he has to spend on those sweet TIF deals. I'll bet you most charter school teachers would agree with me on this. Anyway, if you want to watch the show, here it is.